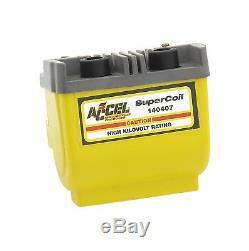 Super Coil; Motorcycle Ignition Coil; Dual Fire; 2.3 Ohms Resistance; Electronic; Yellow; Each. Two Generations of Family Owned and Operated History. ADCO RV & Trailer Covers. Air Lift Air Spring Kit. Alloy USA Axle Kits Shafts. Anzo USA Head & Tail Lights. Bedrug - Truck & Van Rugs. Dee Zee - Truck Accessories. Draw Tite - Hitches Towing Acc. Fabtech - Lift Kits & Shocks. Go Rhino - Truck Accessories. Hellwig Sway Bars Load Control. Husky Liners - Floor/Cargo Mat. Jet Chips - Performance Chips. KC Hilites OFF ROAD LIGHTING. LUK Clutch kit & Components. Lund Nerf Bars Tonneau Covers. Marinco - RV & Boat Electrical. Meyer Snow & Ice Removal Equip. N-Fab NERF BARS LIGHT BARS. Pop and Lock TAILGATE LOCKS. Pro Comp Alloy - Alloy Wheels. Pro Comp Off Road Accessories. Street Scene - Body Styling. Surco Luggare Bike Roof Rack. Tow Ready Hitch Balls mounts. Warn - Winches & Accessories. Westin Nerf Bull Bars Bumpers. 45% Higher Voltage Output Than OEM. For more than 40 years, ACCEL has been a leader in performance fuel and ignition systems, proving itself on the racetracks and drag strips of the world - and on the street. With an ever-expanding line of SuperCoils and all the spark plug wires, tune-up kits, and fuel injectors hot rodders have trusted and relied on for years, ACCEL is constantly developing innovative new products designed to push power, speed, and performance to match advancements in automotive technology. Now part of Holley Performance, ACCEL offers a comprehensive selection of performance products, including coils, digital fuel injection systems, fuel injectors, distributors, caps, rotors, ignition wires, spark plugs. Founded in 1967 as central New York's premier engine, machine and speed shop, today's Burkart Automotive represents two generations of family-owned and operated history. As the area's racing and performance hotspot, Burkart Automotive helped mainstream drag racing by bringing such big names as Bruce Larson, Tommy Ivo, King and Marshall and an array of other kings of the quarter mile on site for appearances as they worked their way across the northeast racing circuit. Burkart Automotive specializes in engine building and machine work, 4x4 and off road accessories, and speed and performance gear. The mission of the team at Burkart Automotive is simple - to be the best choice in the industry for your high-quality speed and performance needs. Whether it's a simple part or a high-performance custom engine, we want your experience to be just right. All retruns must be in original box unopened. We reserve the right to refuse any return. The item "ACCEL 140407 Super Coil Motorcycle Ignition Coil Dual Fire 2.3 Ohms Resistance" is in sale since Sunday, September 24, 2017. This item is in the category "eBay Motors\Parts & Accessories\Car & Truck Parts\Ignition Systems\Coils, Modules & Pick-Ups". The seller is "burkartautomotive" and is located in Multiple Warehouses. This item can be shipped to United States, Canada, United Kingdom, Denmark, Romania, Slovakia, Bulgaria, Czech republic, Finland, Hungary, Latvia, Lithuania, Malta, Estonia, Australia, Greece, Portugal, Cyprus, Slovenia, Japan, Sweden, South Korea, Indonesia, Taiwan, South africa, Thailand, Belgium, France, Hong Kong, Ireland, Netherlands, Poland, Spain, Italy, Germany, Austria, Russian federation, Israel, Mexico, New Zealand, Philippines, Singapore, Switzerland, Norway, Saudi arabia, Ukraine, United arab emirates, Qatar, Kuwait, Bahrain, Croatia, Malaysia, Brazil, Chile, Colombia, Costa rica, Dominican republic, Panama, Trinidad and tobago, Guatemala, El salvador, Honduras, Jamaica.